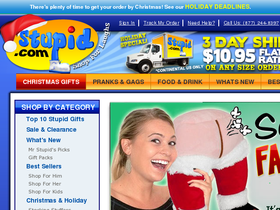 Stupid.com is your one-stop shop for all things hilarious - whether it's funny gag gifts, playful pranks, or just stupid stuff, they've got it all. It's their goal to make your shopping experience as entertaining as the stupid things you're buying from them - so they've added a little humor with each item! Besides, life is way too short not to laugh. So come go on in, have some fun, buy some stuff, and go make someone else laugh! Save on your next purchase from Stupid.com with discounts, coupons and savings from 58coupons.com. Save 5% on orders of $20 or more from Stupid.com when you use this code at checkout. Click and save. Visit Stupid.com for some great gag gifts for only $1.50! Click link to see their selection.